I have written before about past winners, and of research sponsored by the Templeton Foundation. Yet I have not found explicit writing that attempts to join together the separate strands of science and the divine through the prism of chaos until I read some of Heller's works. This may be because of his very obvious dual hats: Heller is both a cosmologist and Catholic priest, who managed to thrive in communist Poland. Various processes in the universe can be displayed as a succession of states in such a way that the preceding state is a cause of the succeeding one… (and) there is always a dynamical law prescribing how one state should generate another state. But dynamical laws are expressed in the form of mathematical equations, and if we ask about the cause of the universe we should ask about a cause of mathematical laws. By doing so we are back in the Great Blueprint of God's thinking the universe, the question on ultimate causality…: "Why is there something rather than nothing?" When asking this question, we are not asking about a cause like all other causes. We are asking about the root of all possible causes. One often pictures fractals as consisting of pretty pictures generated by computer programs, but they are quite prevalent in nature. A notable example can be found in the fossils of ancient cephalopods, specifically nautiloids and ammonoids. Nautoloids and ammonoids are the ancient ancestors of modern squids, octopi, and the nautilus. The ancient organisms looked like modern squids and octopi with shells, some elongated and some coiled like a snail. These shells had internal chambers that the organism filled with gas for buoyancy. Each chamber is separated by a wall, or septa. The contact line between the septa and the inner shell wall is called a suture line. The structure of the suture line determines how well the organism can resist water pressure and adjust its buoyancy. The evolution of suture lines follows an increasingly fractal-like pattern from straight sutures to highly undulated sutures. In complex sutures, the dips and folds in the undulations are called lobes and saddles, respectively. Or rather, what in the world goes on when a writer for almost any type of publication - whether mainstream or not - writes about anything that remotely touches on science? My latest gripe? The May 12, 2008 issue of Newsweek contains a very positive article about students at MIT trying to lower energy costs wherever "energy hogs" exist, with a major hog - your typical vending machine - one of the main targets of their energy-waster-busters attention. Unfortunately, the amount of energy consumed by an average vending machine is incorrectly stated. According to Newsweek "The average soda dispenser consumes 3,500 kilowatts a year." As anyone who actually pays utilities should know, a kilowatt is a rate of energy use (it's 1000's of joules/sec). The actual unit of energy used is then found by multiplying the Rate of energy use x running time, i.e. the kilowatt-hour (kW-hr). One kW-hr is the amount of energy used by a device running at a rate of 1 kW for 1 hour. This energy amount is typically how your electric bill is determined by the electric company that services your home. The price per kw-hr will vary depending on the area of the country, the source of the electric company's energy, and time of year. Current rates for my area are approximately 17cents/kw-hr. 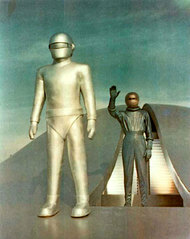 Klaatu barada niktoOne of the great lines in all of 20th century science was uttered over lunch by Enrico Fermi. In a discussion of the possible likelihood of many advanced civilizations in our galaxy, Fermi said something to the effect of "well, where the hell are they." The equation consists of a chain of probabilities, all multiplied together in the fashion of the probability of a string of independent events. Depending on the values of the individual probabilities, estimates of the average number of advanced civilizations/galaxy range from several thousand to less than one.